Posted on November 20, 2016 by Vinay A. In IT industry, every company talks about Quality. I think there is widespread misperception among IT professionals that quality means quality of the software only. This is not true completely. In my opinion, quality is a way of life. Anything that you do in office should be of the top quality. Quality should be practiced every minute in every small thing that you do. Besides programming, quality is also equally important in the following. I have seen technical people who do great in everything but there are such people also who give less importance to anything which is non-technical and hence end up doing poor communication, bad in building relationship, pathetic in email writing. IT is a technology driven industry. Having great ability to write top quality code may fetch you compliments like ‘great developer”, ‘good programmer’ ‘develops high quality software’ etc. But it may not invite comments like ‘a true professional’, ‘an asset to organization’, ‘top quality professional’, ‘privilege to work with’ etc. To be a true professional, you really have to be top class in everything and not just limited to quality coding. Quality should be like the blood flowing from top to bottom every minute. In my experience, many people usually give less importance to writing emails. Email is the virtual face of you. The choice of words, tone, knowledge of target audience and clarity reflects your personality. We must take email writing very seriously and strive for perfection in this skill as well. 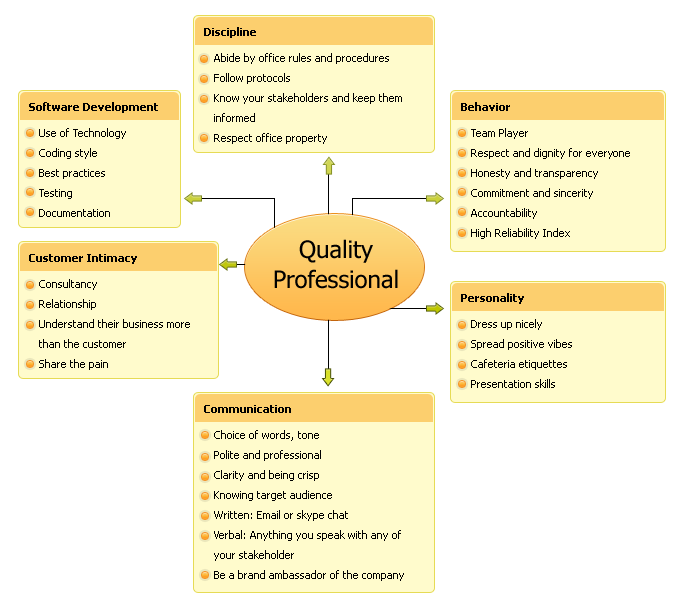 Though definition of Quality is not limited to what is explained in the following diagram, but this diagram explains some of the key attributes of office life where Quality must be practiced.